The set of Grasshopper components we created to calculate and visualize embodied carbon contents of structures. A building structure is made up of many different material combinations. It is not always intuitive to understand which material combination for a specific building type is more efficient, when it comes to embodied carbon and embodied energy impacts. Furthermore, a typical concrete structure still contains about 8 to 10 psf of structural reinforcing steel, and vice versa, a steel structure contains large amounts of concrete. This calculation becomes even more complex when trying to compare different building typologies, say a low rise building with a column grid spacing of 30ft, with a high rise building with a column grid of 25ft, even if the net floor area is the same. And to further complicate these equations, one can also bring different concrete strength values into the mix, or consider supplemental cementations materials or recycled steel. Because of their complexity and due to convention, embodied energy calculations are never really part of a structural engineer’s range of services during the initial design phase. If considered at all, they will only be calculated for building evaluation, once the design has been more or less set. But wouldn’t it be great if these calculations can be embedded into the concept design phase, so that the architects, engineers, and owners can really understand the impact that their design might have on the environment, and use this understanding to design a better and more environmentally responsible building? After all, according to a diagram published by MIT, embodied energy is an important contributor to the lifetime energy consumption of highly efficient buildings, and of those that have life spans of a century or less. The ability to preliminarily size beams, columns, slabs and foundations already during the early concept design phases has the nice side effect of letting us compare structural material quantities at any point of the design process. (Read our earlier blog post if you are interested in the tools we developed to quickly let us calculate structural member sizes inside of a parametric design model.) So, with the help of the Inventory of Carbon & Energy, a database of embodied average energy/carbon coefficients created by the University of Bath, we can calculate the total amount of embodied carbon and embodied energy of any design configuration early on. We brought part of this database into a format that Grasshopper can understand and created a range of Grasshopper components, which let us calculate and visualize embodied carbon contents of most structures in real time. 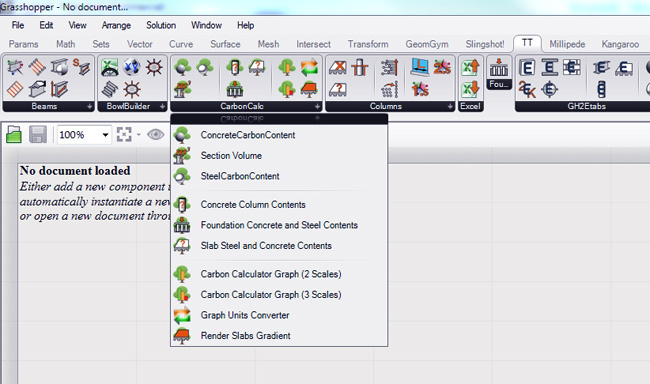 When combining this suite of tools with our generative structural design suite, we can compare different building typologies, column grid layouts and combinations of structural materials to understand the impact that one design option has versus another one and to ultimately optimize the structure from a sustainability point of view. And to visualize these calculations, we also developed a set of graphs, and use the Grasshopper gradient tool to color code the building model. Look at our video below to see the tools in action.